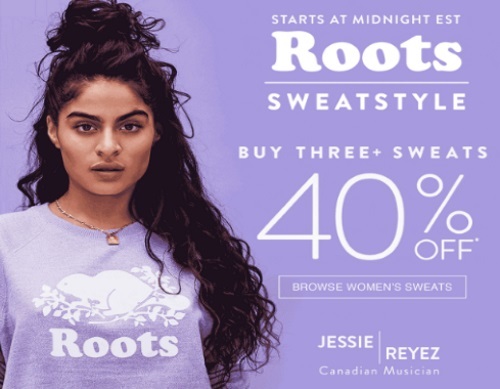 Roots' Sweats Sale is back! Starting at midnight tonight get up to 40% off sweats! Enjoy up to 40% off sweat styles as marked. (20% off with the purchase of 1 sweat style, 30% off with the purchase of two sweat styles, 40% off with the purchase of three or more sweat styles). Offer valid at 12:01AM EST on Thursday, August 24, 2017 and expires at 11:59PM EST on Monday, September 4, 2017.